The VA estimates that more than 500,000 former service members hold other-than-honorable discharges. About 125,000 of them are post-9/11 veterans, according to Iraq and Afghanistan Veterans of America. It's official. Veterans with other-than-honorable discharges can get 90 days of mental-health help from the VA. The U.S. Department of Veterans Affairs announced the policy Tuesday, confirming a move that VA Secretary David Shulkin telegraphed back in March. Otherwise, veterans with these “bad-paper” discharges -- which usually result from minor crime or misbehavior while in uniform — wouldn’t be eligible for care at VA hospitals. The move is aimed at reducing the 20-a-day suicide rate among veterans. Also on this, a little background; Vietnam Veterans of America have fought for all generations of veterans to receive justice. Veterans without access to the VA are seven times as likely to end up homeless, six times as likely to end up in jail and 30 percent more likely to die by suicide. That’s due, in part, to downsizing in the military, said Kristofer Goldsmith, assistant director for policy and government relations at Vietnam Veterans of America. Between 2000 and 2015, the size of the military dropped from 3.8 million service members to 1.1 million, according to data from the Department of Defense. And military cuts are expected to continue in coming years. 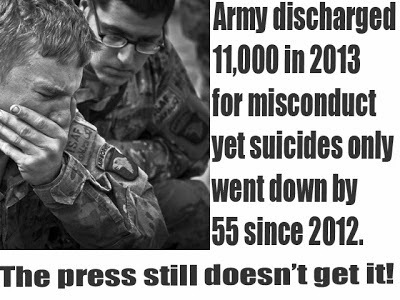 Goldsmith, who was other-than-honorably discharged in 2007 after a suicide attempt, said the easiest way for commanders to meet those cuts is by issuing more bad-paper discharges, cutting short those service members’ active-duty time. Now that you see that, keep in mind that as the "training" the DOD was pushing to "prevent" the "one too many" suicides they kept talking about, the numbers did not go down to reflect that size drop in the number of service members. How is that for "awareness" now?